We’d just eaten a meal at Grand Central Terminal in New York City. My wife was going to do some shopping so I decided to go to a nearby Barnes and Noble to see what I could find. I was walking along 43rd Street when I came across this statue. I hadn’t seen it before and it looked interesting so I took a few pictures. When I eventually read the story behind it I was even more fascinated. According to Big Apple Secrets. Hidden Treasures of New York. 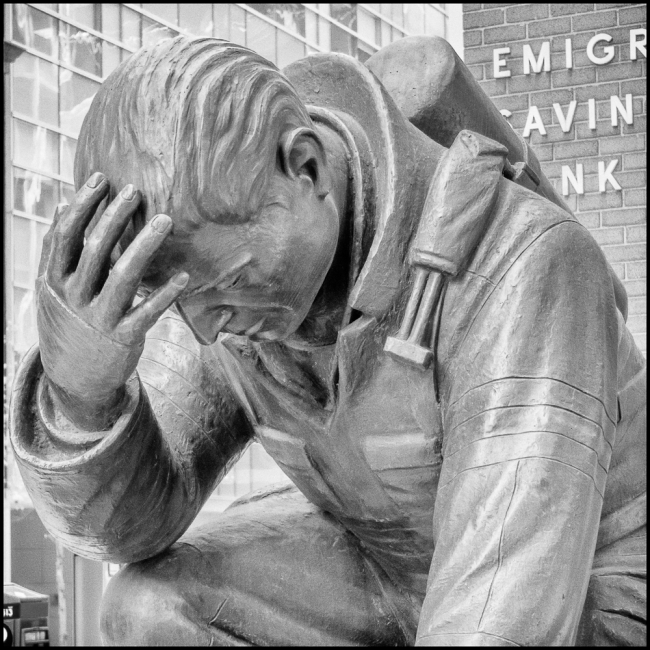 The dramatic statue of a firefighter on bended knee is located at 43rd Street near the headquarters of Emigrant Savings Bank. The “Kneeling Fireman” is one of NYC’s 1st memorials to 9/11. The statue arrived in New York City two days before the death and destruction on 9/11 because it was originally commissioned by the Firefighters Association of Missouri. Over 100 fire departments in Missouri met in 1954 for the purpose of forming a state-wide firemen’s association. Since organizing in 1954, the organization has grown from 600 members to more than 7,000 members. 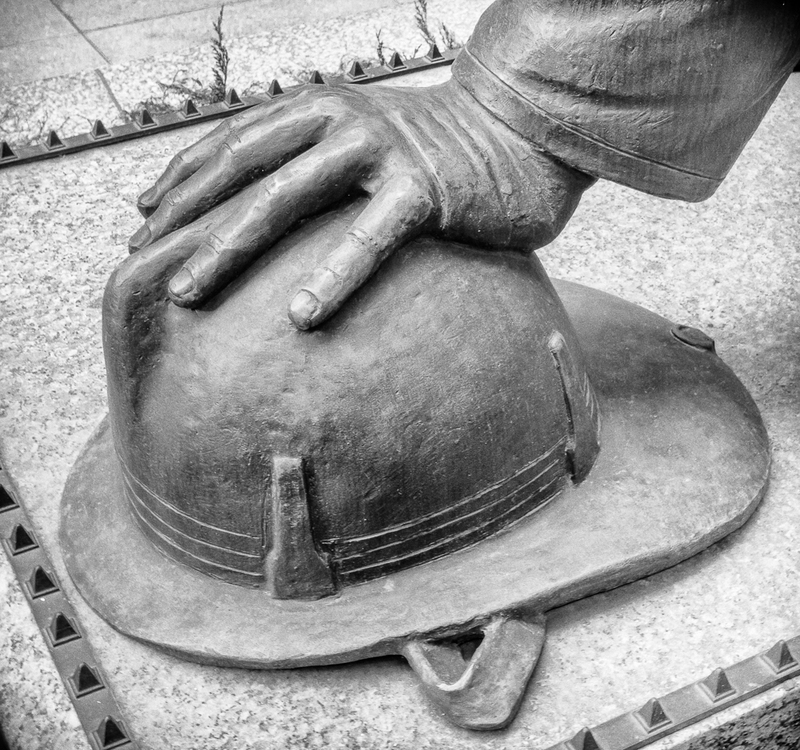 October 2000 Matthews International Corporation of Pittsburgh received the commission to create the bronze statue for the Firefighters Association of Missouri. The Matthews International was formed in the middle of the 19th century when the founder of the company John Dixon Matthews arrive in US from England. Among the Matthews Bronze products are flush bronze memorials, cremation urns, and monuments. One of the most famous of the company’s bronze memorials marks the grave of Elvis Presley. The statue for Missouri was custom manufactured by Matthews plant in Parma, Italy in August 2001. On September 11, 2001 a 2,700-pound bronze statute sat at JFK International Airport en route from Italy. “Our customers started calling us to find out if we had plaques, anything commemorative,” Corinne Laboon, Matthews’ public relations director said. “We sat down to discuss ideas and someone brought up the firefighter statue. 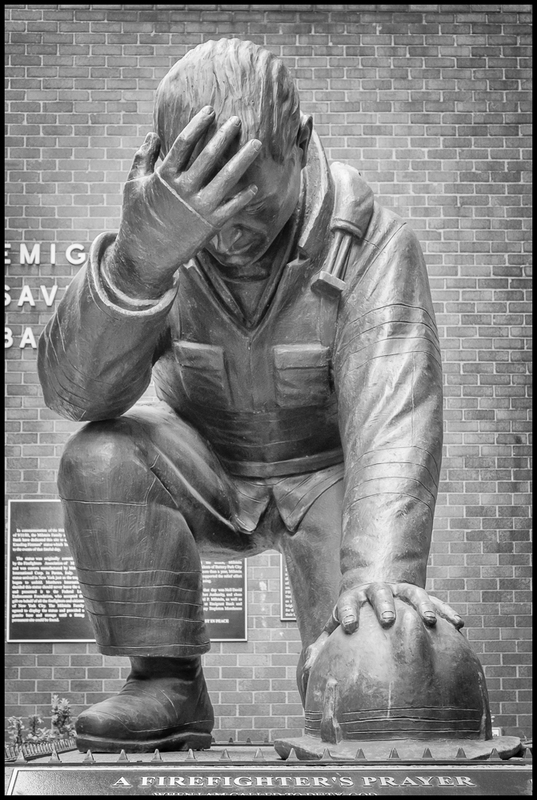 We called the Firefighters Association and without hesitation they decided to dedicate the statue, with Matthews, to the citizens of New York.” Matthews promised to the Firefighters Association of Missouri that Matthews would make and supply them a duplicate firefighter statue. The copy of the statue was unveiled in Missouri during the Memorial dedication on May 18, 2002. This entry was posted in Black & White, Statues, Things. Bookmark the permalink.